Facebook CEO Mark Zuckerberg told lawmakers that regulation of his company is “inevitable,” but still came to Capitol Hill prepared to defend against proposals he thought went too far. He rarely had to. After about 10 hours of hearings on Tuesday and Wednesday, markets rallied and privacy advocates were disappointed at the prospect that Facebook appeared to emerge unscathed, left to its own devices to manage how it collects vast amounts of personal data and handles user privacy. Some legislators touted their various proposals for privacy protections, including bills introduced this week responding to the privacy scandal involving some 87 million Facebook users whose data was swept up by the political data-mining firm Cambridge Analytica. Increased regulation “is a very real possibility,” said Oregon Republican Rep. Greg Walden, chairman of the House Energy and Commerce Committee, which held Wednesday’s hearing. But after it was over, Walden acknowledged there’s little consensus. “There’s a division, I think, and I think still people want to know more about what the companies themselves can do,” Walden said. Zuckerberg often professed his willingness to work with lawmakers on legislative ideas or said he’d get back to them. 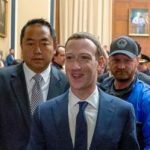 He made few commitments and promised that Facebook could protect users on its own with better algorithms and advances in artificial intelligence. The top Democrat on the panel, New Jersey Rep. Frank Pallone, said after the hearing that he thinks the Democrats “made it quite clear that we need some comprehensive legislation on privacy and data,” but didn’t say exactly what that would look like. It’s not that Zuckerberg wasn’t peppered with some tough questions from both parties about his company and its business model. Asked by Republican Sen. Lindsey Graham on Tuesday if Facebook was a monopoly, Zuckerberg quipped, “certainly doesn’t feel like that to me.” Just a few moments earlier, though, he had struggled to name direct competitors. Under U.S. antitrust law, corporations deemed an illegal monopoly can be broken up into smaller parts by federal regulators. No one asked Zuckerberg about that, though his notes, which an Associated Press photographer spotted on his desk, showed he was prepared for the question. While it became clear this week that Congress has no unifying idea about how to tame Facebook’s power in a useful way, neither do many of the privacy and consumer advocates calling for heightened regulation. “I think the interesting regulatory approach is not a breakup or more privacy, but rather an unbundling of Facebook,” said Chris Hoofnagle, a professor at UC Berkeley’s Center for Law and Technology. He said it could happen the same way the Federal Communications Commission forced AOL to unbundle its instant messaging service by making it compatible with the systems used by rival internet firms. The unbundling agreement was a condition of the deal that allowed AOL to merge with Time Warner. “Imagine if competition authorities forced Facebook to open its walled garden and allow third party apps to interoperate without all the invasive properties of the Facebook app,” Hoofnagle said. What happens next is unclear, but Bedoya said he hopes Congress can focus on a package of specific reforms, such as protections that forbid tracking individuals by location or facial recognition without their consent. Such measures should also strengthen the Federal Trade Communication, which has a 2011 consent decree against Facebook that remains one of the U.S. government’s most powerful protections against future privacy abuses. Walden, noting that Facebook is already regulated by the FTC, said the company will face hefty fines if it violates those regulations on a second offense.